Please see the previous article at http://ponnadi.blogspot.in/2014/01/virodhi-pariharangal-10.html. 42. lakshaNa virOdhi - Obstacles in our identity, appearance and behaviours. Many different aspects are discussed under this section. lakshaNam means appearance, identity among other meanings. Translator's note: In our samskritham literatures, lakshaNam is generally associated with the unique characteristics that distinguish one entity from another. This topic covers some aspects of pancha samskAram like thApam (accepting sankam and chakram on ones shoulders, applying Urdhva puNdram on 12 parts of the body), physical appearance, dress-code, etc. Very interesting and subtle points are highlighted in this section. First there is detailed discussion on thApa samskAram which is part of pancha samskAram (samAsrayaNam) - the process of being initiated in to srIvaishNava sampradhAyam. thiruvilachchinai (thaptha mudhrA on the shoulders indicating that a person has undergone samAsrayaNam - pancha samskAram) must be clearly visible. This mudhrA is embossed on the shoulders by heating the sangu (conch) and chakram (disc) with specific manthrams by the AchAryan. While it may appear like a boil/wound initially, eventually it will heal and the mark remains on the shoulders forever. This is the first samskAram in samAsrayaNam or pancha samskAram - the process of initiating oneself into srIvaishNava sampradhAyam. It is essential that the marks remain clearly visible on the shoulders for srIvaishNavas. Not having visible marks is an obstacle. Translator's note: In many AchArya pItams, it is seen that, the conch and disc are heated moderately and placed gently on the shoulders of the sishyas - this ends up in not having very visible marks on the shoulders. As this practice is seen in practice in many AchArya pItams, it is considered as sistAchAram (that which is done by our elders) in this case. There is another way of accepting thApa samskAram - which is using flowers - this is called pushpa samAsrayaNam/samskAram. This is not seen in our sampradhAyam at present. This practice is pursued by asishtas (people other than our pUrvAchAryas) and thus is not to be pursued by srIvaishNavas. thApa samskAram using heated conch and disc is the proper way of getting initiated. Not doing that is an obstacle. Undergoing thApa samskAram (using heated conch and disc) to cure bodily diseases is an obstacle by itself. It is to be properly understood that the whole purpose of this pancha samskAram is to relieve us from the biggest disease called samsAram (being in the repeated cycle of birth and death) and to uplift us to eternal and blissful life of service to bhagavAn in paramapadham. Undergoing this pancha samskAram without this understanding is an obstacle. The conch and disc are the eternal identify of bhagavAn. One should wear them with great joy that they are wearing the symbols of their dear lord and master. Not having that joy is an obstacle. By becoming a srIvaishNava one becomes detached from samsAris (materially minded people). One should not feel ashamed for being separated from samsAris. By becoming a srIvaishNava one becomes dear to other srIvaishNavas. One should feel great joy in thinking that "now I will be accepted by srIvaishNavas". Not having such joy is an obstacle. Next there is detailed discussion on applying Urdhva puNdram. There are many subtle points discussed in this section. First we will see some important aspects in this topic. thiru maN - sacred soil. kAppu - protection for the ones who wear it. So, Urdhva puNdram is known as thirumaN kAppu in thamizh. thirumaN kAppu is also known thripuNdram (because it involves 3 lines) - it is applied vertically from bottom to top. Our elders have analysed the appropriate parts in sAsthram and determined many important aspects about Urdhva puNdram. It is a big shame that srIvaishNavas are not understanding the glories of Urdhva puNdram and applying it properly. thirumaN kAppu (Urdhva puNdram) should be applied based on the proper method (as learnt from proper source) in a clean and beautiful manner. One incident can be recollected in this regard. Everyone knows the incident where kUrathAzhwAn loses his eye sight in chOLa king's court. Some srIvaishNavas felt very sad and shared their grief with AzhwAn about his loss of eye sight and going through extreme pain. At that time, AzhwAn magnanimously and humbly states that "This is the result of bhAgavatha apachAram. I should have looked at some one's Urdhva puNdram and have considered that its not applied properly". So, we should not apply our Urdhva puNdram casually/improperly so that elders look at it and feel grief. It is our essential duty to avoid putting elders and other srIvaishNavas in a difficult situation. thirumaN is made of pure white powder. It is also known as dhavaLap podi (dazzling white powder). We understand from purANams that periya thiruvadi nAyanAr (garudAzhwAr) brings this sacred soil from svEtha dhvIpam and placed them in certain places in bhAratha dhEsam. This is found nowadays in few places like thirunArAyaNapuram, ayOdhyA, etc., in the form of white clay. This white clay is dug out from the ground, mixed with water, processed and dried to make the blocks of thirumaN. This can be purchased in many dhivya dhEsams for a price nowadays. Though there are some disagreements - I am (Dr V V Ramanujam swamy) sharing what I have learnt from elders and studied in various literature related to our sampradhAyam. A prapanna (srIvaishNava) should wear Urdhva puNdram using white soil named svEtha mruththikA (white soil) on his forehead (and other parts). While applying Urdhva puNdram, one should remember/recite bhagavAn's thirunAmams (holy names). This is why thirumaN is also known as thirunAmam (or just nAmam at times). nammAzhwAr glorifies the dhvAdhasa (twelve) nAmams (names) of srIman nArAyaNan in thiruvAimozhi 2.7 decad (padhigam). In the introduction section of the commentary for this padhigam it is said that "vaishNavathva chinhamiRE thirudhvAdhasa nAmam" (வைஷ்ணவத்வ சிந்ஹமிறே திருத்வாதச நாமம் - The twelve names/puNdrams symbolize vaishNavam - that which belongs to srIman nArAyaNan). 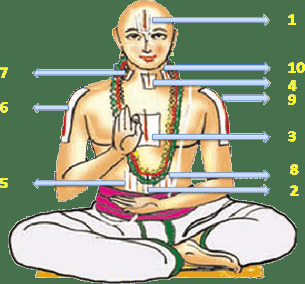 It is explained in sAsthram that one must wear 12 puNdrams in the following 12 parts of the body (in the following sequence). In thiruvAimozhi 4.4.7, nammAzhwAr says "nIRu chevvEyidak kANil thirumAladiyAr enROdum" (நீறு செவ்வேயிடக் காணில் திருமாலடியார் என்றோடும்) - if I see any one wearing the soil in a vertical fashion (Urdhva puNdram), I will consider/appreciate them as a servant of srIman nArAyaNan. So, we can understand that we must apply vertical symbols only. Translator's note: It is often seen that even srIvaishNavs apply other things such kumkum, sandal paste or even ashes which are to be completely avoided - in a horizontal manner. This practice must be completely avoided. 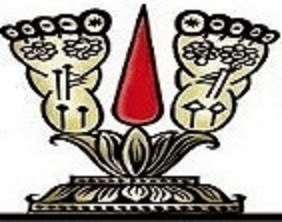 thirumaN is applied in hari pAdha Aktruthi (in the form of the lotus feet of srI hari) with the pAdha pIta padhmam (the lotus which is holding the lotus feet). Translator's note: nammAzhwAr says in thiruvAimozhi 4.5.8 "thaNthAmarai sumakkum pAdhap perumAn" (தண்தாமரை சுமக்கும் பாதப் பெருமான் - lord whose lotus feet as held by cool lotus). It should be applied with as vertical lines. Two white lines (left and right) indicate the lotus feet of emperumAn. The red line in the middle indicates srI mahAlakshmi and is known as srI chUrNam. srI chUrNam is prepared from turmeric powder. It is also known as haridhrA chUrNam. When processed this becomes red in colour. The padhma pItam (lotus at the bottom) should be applied using thirumaN only on the nose. Between the two white lines (which represent emperumAn's lotus feet), there should be two inches distance minimum. Each white line should be one inch wide. Only in the forehead, the pAdha pItam is applied. In all other 11 places, thirumaN is applied without an explicit extended lotus feet. There are restrictions applicable for the size of thirumaN in each part of the body. Please learn further on this topic from the elders. Let us now see the obstacles in this sub-section of lakshaNa virOdhi. Using thirumaN which is retrieved from places which are not approved by our elders is an obstacle. Not using thirumaN from dhivya dhEsams (such as thirunArAyaNapuram, srIrangam, ayOdhyA, etc) which are approved by our elders is an obstacle. Applying thirumaN without understanding the glories of such dhivya dhEsams from where the thirumaN is brought is an obstacle. One must think "Oh! this thirumaN is from ayOdhyA, this is wonderful!" and apply the thirumaN. Being a mumukshu, one should only apply white thirumaN. Not doing so is an obstacle. It seems there are different colored thirumaNs (and srI chUrNams too) for achieving different goals. It is an obstacle to pursue such practices. Our pUrvAchAryas approved applying hari pAdha Akruthi (in the form of lotus feet of emperumAn). There are other forms of puNdrams too - but our pUrvAchAryas have only approved applying hari pAdha Akruthi for us after analysing the sAsthram fully. Applying very small thirumaN (in dot form) is an obstacle. Translator's note: It is seen some times people wearing just 4 dots in the four corners of the thirumaN - this may be referring to such practice. thirumaN should not be applied in a very narrow manner. Translator's note: As explained before there should be minimum 2 inches gap between two vertical white lines. Applying thirumaN without knowing the exact measurement our pUrvAchAryas used is an obstacle. thirumaN should be applied at all the specified 12 body parts. Not doing so is an obstacle. Translator's note: It is to be observed in many of our pUrvAchArya granthams that wherever applying thirumaN is explained, there is always mention of dhvAdhasa Urdhva puNdram (applying twelve thirumaNs) - so everyday, srIvaishNavas should apply 12 Urdhva puNdrams only. Also, the 12 thirumaNs must be applied in the proper order (as explained before) starting with remembering kEsava nAmam (followed by other names of emperumAn as appropriate for each part). All 12 thirumaNs should be applied at the right parts of the body. After applying thirumaN, one should not adjust them using the finger nails. One should not apply thirumaN without srI chUrNam in the middle. Translator's note: Only during charama kainkaryams (final rites) and Asoucha kAlam (period of contamination for birth/death of relatives) - thirumaN alone is applied - all other times, both thirumaN and srI chUrNam should be applied together. thirumaN represents emperumAn (his lotus feet) and srI chUrNam represents thAyAr - one should not never separate them from each other - it is a great sin. thirumaN should be mixed with remembering srI sailEsa dhayA pAthram thanian, AchAryan thaniyans, rahasya thrayam (thirumanthram, dhvayam, charama slOkam), etc. Other manthrams should not be recited while mixing/applying thirumaN. thirumaN should be applied only with own fingers. No instrument should be used to apply thirumaN. thirumaN mixed with water that was used by materially minded people should not be used. Not applying thirumaN that was mixed with water that was used by bhAgavathas is an obstacle - i.e., we should use water that was used by bhAgavathas to prepare our thirumaN. Using water that was fetched for AchAryan to prepare our thirumaN is an obstacle. One should not apply thirumaN in front of samsAris (materially minded people). One should not get thirumaN from samsAris (materially minded people) and use it. thirumaN should be worn thinking that this is the proper identity for vaishNavas. Not doing so is an obstacle. Applying thirumaN simply because it was ordered in sAsthram is an obstacle. Translator's note: It should be applied with great delight as explained in previous point. thirumaN should be applied considering it is very dear to bhAgavathas. Not doing so is an obstacle. thirumaN should not applied over and over again (wiping off the previous attempt) to get it look perfect. It should be properly and patiently applied once and never wiped off. One should always use thirumaN and srI chUrNam that are the remnants (remainder) of ones own AchAryan. Even if the thirumaN is not directly from AchAryan, one should meditate and pray to the AchAryan that it becomes his remnants (after offering the same to him mentally before using). Not doing so is an obstacle. One should not use the thirumaN which is kept for the use of AchAryan and let him use the remainder. This is a great sin. One should never be present in front of bhagavAn, bhAgavathas and AchAryan without thirumaN in the forehead. Translator's note: We can recollect the incident where emperumAnAr himself hid his face (by covering with a cloth) in thirunArAyaNapuram when he had no thirumaN left with him to apply on him. emperumAn at once showed him where to find thirumaN and emperumAnAr happily collected the thirumaN and applied it soon after. Next there is detailed discussion about wearing thuLasi/lotus stem mAlA (garlands), etc. Wearing thuLasi or lotus (stem) mAlA separately is an obstacle. thuLasi and lotus stem, when dried completely, can be made as small beads and is used to prepare garlands/necklaces. They should always be worn together and cannot be worn separately (i.e., one or the other). Translator's note: As said in "yE kaNta lagna thuLasi nalinAksha mAlA; yE bAhu mUla parichinnita sankha chakrA; ye vA lalAta phalakE lasadh Urdhva puNdrA; thE vaishNavA bhuvanam Asu pavithrayanthi" - by the presence of srIvaishNavas who wear thuLasi/lotus stem garlands, who has the symbol of sanka and chakra embossed on their shoulders and who wears the Urdhva puNdram (thirumaN) on their fore head, the place where they stay becomes purified. It is often seen people wearing one or the other (thuLasi beads mAlA or lotus beads mAlA) - here it is said that they should always be worn together. srIvaishNavas also wear pavithra mAlA which was worn by emperumAn/AzhwArs/AchAryas. Not wearing it upto the naval is an obstacle. Translator's note: It should be worn for the full length, hanging down upto the naval. 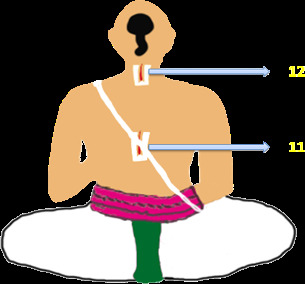 In other sampradhAyams, it is seen that it is worn tightly around the neck. But our pUrvAchAryas wore it full length - this can still be observed in pavithra mAlAs at various temples, where they are worn for full length (upto naval). Wearing twisted waist string is an obstacle. Translator's note: waist string is a mandatory aspect for a vaidhIka. One should never be without it (will be highlighted in the next point too). It is said here that one should not wear the type of waist string that is twisted. Being without a waist string is an obstacle. Known as arai nAN kayiRu (அரை நாண் கயிறு - waist string) in thamizh - this is one of the essential things to be worn always. Being short of (not wearing) of antharIyam (dhOti/vEshti - main wrap), uththarIyam (anga vasthram - wrapped on top of dhOti) and kaupInam is an obstacle. Translator's note: One should always be with antharIyam and uththarIyam. Only while performing certain apara karmA (post-death rituals) and tharpaNam, antharIyam alone is worn - no uththarIyam in those situations. During all other times atleast two clothes must be worn. Nowadays, it is very common even amongst learned people to walk around with single dhOti - this should never be done - one should always have uththarIyam with the antharIyam. kaupInam is the loin cloth - this is natural under-garment without any stitching. vaidhIkas should not wear any clothes that has undergone stitching - while performing kainkaryams, etc., only woven clothes are worn. Using black blanket is an obstacle and should not be used. Using torn clothes or damaged clothes is an obstacle. While wearing dhOti, it should be worn in such a way that the end parts are not flowing downwards. Wearing clothes (dhOti, saree, etc) without borders is an obstacle. Not wearing a string/thread around the dhOti to protect the dhOti from falling off is an obstacle. Shaving the body without shaving the head is an obstacle. Translator's note: For brahmachAris and sannyAsis, only head/face shaving is allowed (no other parts of the body can be shaved). For gruhasthas, they should do sarvAngam shaving (shaving all parts of the body from head to toe, except upper back) everytime - just face shaving/hair cutting is not allowed. It is also important to note that even while shaving the head it should not be fully tonsured - there should always be a sikai (kudumi - tuft). Full tonsure which is done casually these days is not authorized at all - generally, the concept of full tonsure is opposite to vaidhIka matham and should not be done. In many pAsurams of AzhwArs fully tonsured head is related to avaidhika sampradhAyams. Keeping/Trimming moustache is an obstacle. Translator's note: Our elders have never maintained moustache alone - either properly shaven (according to one's varNa and Asrama) or grow both moustache and beard together (without shaving) according to ones own situation. For example, during dhIkshai (period of vow while wife is pregnant, the first year after parents passing away, etc) no shaving is performed. But just keeping moustache and trimming it is not permitted. Growing long nails is an obstacle and should be cut appropriately. Translator's note: Some of the above aspects may seem rigid and even odd. But there are also practical reasons for all of these. For example having long nails will be an obstruction while performing kainkaryam and may even harm oneself or others. Next discussion is about wearing fragrances, etc - mostly aspects related to self-indulgence and material enjoyment. Obviously we can understand that these are to be avoided by srIvaishNavas. applying "make up" items on face, etc., for physical beauty. applying a lot of sandal wood paste, etc. Translator's note: Here the focus is on over indulgence - as per varNAsrama dharmam gruhasthas can accept a little bit of sandal wood paste which is distribute at times at sannidhis as prasAdham of emperumAn. applying sandal wood which is not offered to emperumAn first is an obstacle. Translator's note: kaNNan emperumAn says in bhagavath gIthA that whatever one eats, does, etc., that should be done after offering to emperumAn first and then only be done by the individual. periyAzhwAr says in thiruppallANdu "uduththu kaLaintha nin pIthakavAdai uduththu..." (உடுத்து களைந்த நின் பீதகவாடை உடுத்து...) - we wear the vasthrams/dhOtis which are first offered to emperumAn. Same principle applies for all we consume/use - first they should be consumed/used by emperumAn. specially requesting and indulging into sandal wood paste, fragrance, etc., that are the remnants of namperumAL. Translator's note: Even bhagavath prasAdham should not be accepted with bhOgya budhdhi (self-enjoyment) and over-indulgence. Everything should be done in moderation and as much is necessary. applying sandal wood with too much body-consciousness. Translator's note: One should understand oneself as the spiritual self and be devoid of bodily desires and enjoyment. After becoming a prapanna, it is meaningless to engage in activities that will increase our attachment to the body. Instead one should focus on the true nature of oneself which is servitorship to bhagavAn and bhAgavathas and focus on that. accepting and enjoying betel leaves and nuts which are not offered to emperumAn first. Translator's note: Again, when distributed as prasAdham, it is OK to accept a litte bit. Betel leaves and nuts are also only consumable by gruhasthas. Unlike sandalwood paste, this can be accepted by brahmachAris and sannyAsis and can be given to others. But sandalwood paste cannot even be accepted by brahmachAris and sannyAsis. Wearing different and heavy ear-rings and pendants in the ears. It is possible that the ears will extend by wearing heavy rings, etc. It is better to avoid such heavy rings. Wearing thuLasi in the ears. It is sometimes seen that thuLasi is kept on the ears - this is not to be done. Finally, a few more aspects are explained here. Brushing the teeth on Fridays. Not clear about this and the reason behind it. There are certain types of black ink/paint which is used to mesmerize and control others. These are generally acquired by worshipping dhEvathAntharams. One should not associate with such things. Wearing strings in neck, hands, legs, etc., for protection. Our protection is thirumaN kAppu (Urdhva puNdram) and sankam/chakram on the shoulders. Translator's note: It is often seen that even srIvaishNavas wear red, black colored strings for protection. emperumAn is our only protection. One should never engage in wearing any such strings. srIvaishNavas can only wear thuLasi, lotus and pavithra mAlAs (garlands) - none other. Wearing silver rings in fingers. Coming in contact with weapons. We should only depend on the weapons of emperumAn. In front of bhagavAn, bhAgavathas and AchArya one (men) should not cover their upper body by putting the anga vasthram on the body. Translator's note: dhAsa vargam (serving class) means having the anga vasthram on the waist - that is why srIvaishNavas never put the anga vasthram on their body. There are certain dhEsAchArams (rules specific to the specific place) - such as cold places where people cover their body with vasthrams, shawls, etc. speaking about materially motivated aspects and having the high-held head with ahankAram (ego). Being without mercy/kindness in the eyes is an obstacle. Our eyes should always exhibit peace and mercy - not anger. Translator's note: It is natural for srIvaishNavas to be kind and merciful and that should be naturally revealed through ones eyes. Speaking subjects that are outside dhivya prabhandham (vyAkyAnams, sthOthrams, rahasya granthams, etc) is an obstacle. Translator's note: Whatever we speak/discuss, that should only be based on pUrvAchArya srIsUkthis. Speaking loudly is an obstacle. While glorifying srI rAmA, it is said that "mruthu pUrvancha bhAshathE" (soft spoken) - it is good to be soft spoken. Gossipping and useless discussions are obstacles. Being without anjali is an obstacle. When not engaged in kainkaryam, one should keep the hands in anjali mudhrA (namaskAram posture). One should not be ashamed (feeling shy) to hold begging bowl in ones hands. Translator's note: It is part of brAhmaNa dharmam to beg for food-grains. Many great stalwarts of our sampradhAyam such as kUrathAzhwAn, vEdhAnthAchAryar, etc., performed unja vruththi (begging for food-grains). Having high-held chest - one should manifest humility in their behaviour. Similar to what is explained in high-held head topic. Walking heavily and in a tensed manner are obstacles. One should walk slowly and be at peace. Folding the dhOti up and wearing it. This is considered dis-respectful. While hearing about bhagavAn and seeing bhAgavathas one should feel great emotions and have goose bumps - naturally out great attachment. Not having so is an obstacle. Translator's note: emperumAn himself explains the eight qualities explained in his devotees and one such quality is having divine emotions while hearing about him. He says "My bhakthas essentially have the following eight qualities - 1) unconditional love for bhakthas of emperumAn, 2) enjoying (others) worship of emperumAn, 3) worshipping emperumAn him/herself, 4) being without any pride, 5) having attachment in listening about emperumAn, 6) having bodily changes (like goose bumps, etc) when hearing/thinking/speaking about emperumAn, 7) always thinking about emperumAn, 8) not asking material benefits in return for worshipping emperumAn. Such bhakthas even if they are mlEchchas, they are worshippable at par with my own self by leaders of brAhmaNas, the meditators, the ones involved in kainkaryam and even sannyAsis and scholars. They are also eligible to give and accept knowledge from such scholars". Similarly, it is explained that, when seeing a srIvaishNava, one should feel like seeing moon (everyone is fascinated by the moon), feeling mild breeze (which is very pleasing) and applying nice sandal paste. Not suffering out of separation from bhagavAn and bhAgavathas. nammAzhwAr shares his grief in separation in thiruvAimozhi 8.2.1 "nangaL varivaLai" (நங்கள் வரிவளை) padhigam. Translator's note: We can recollect the incident of ALavandhAr and his sishya dheivavAri ANdAn - when ALavandhAr goes to thiruvananthapuram, ANdAn becomes very sick and only recovers after seeing ALavandhAr again. Ones gyAnam, bhakthi, vairAgyam should be manifested in ones own form. Automatically, one should understand that by seeing the person. Not being so is an obstacle. Translator's note: In kUrathAzhwAn's charithram, it is said that any one seeing AzhwAn will become purified - such is his qualities that are also manifested in his physical appearance perfectly. Not manifesting ones vaishNavathvam in ones form (physical appearance) naturally is an obstacle. Similar to previous point.